Founded by our alumnus Filip Libal, Proboston Creative is a digital advertising agency focusing on interactive online and offline media. Focusing on digital marketing strategy and innovations, the company creates interactive campaigns, motion graphics, social media trackin gand advergaming. 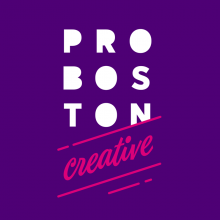 Proboston Creative may be a small, independent studio, but they work for big-name clients, including T-Mobile, Kaktus, McDonald's, Wrigley Skittles and many other well-known names and brands.